Changing File Permissions - SiteVision, Inc. The FTP software allows you to set file permissions on your content to allow your website to modify files. This process will vary between FTP clients. In FileZilla, right click on the file or folder you want to change permissions on and select File permissions. 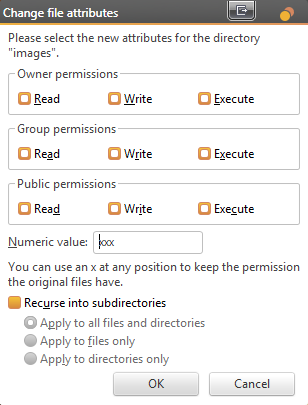 Use the checkboxes to select the permissions you want to give the file/folder, or enter the Unix numeric value. 700 - The owner has full access to the file, e.g. only the FTP user can read or write to this file. 770 - The owner and its group will have full access, e.g. the FTP user and the FTP service group. 777 - The owner, group, and web server will have full access. This does not mean other FTP users will have access. This is the required setting if your website needs to modify the file. 755 - The owner has full access and everyone else has read and execute access, but not write access. If you change the permissions with the checkboxes, you will see the numeric value automatically update.